It's hard to believe it's already October! 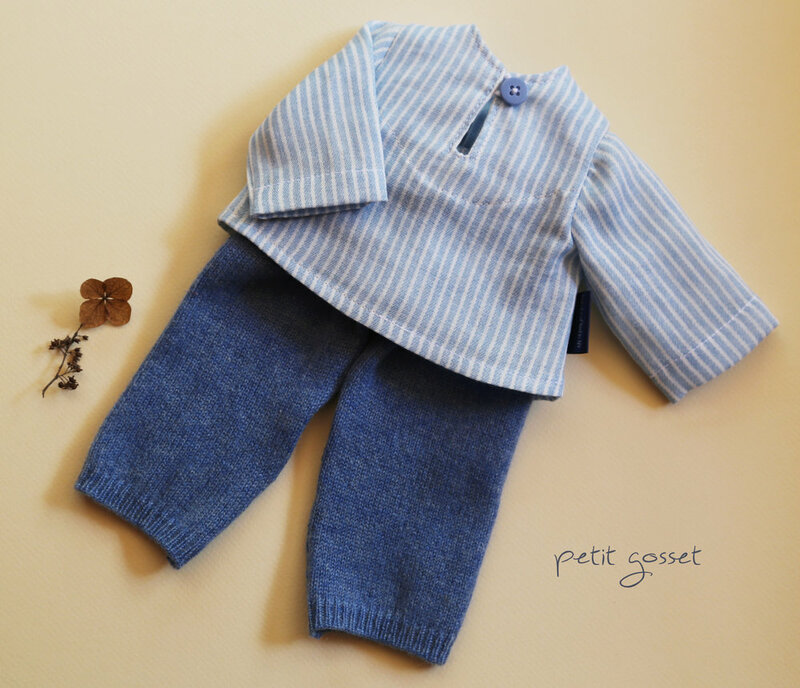 To freshen up your doll's wardrobe and keep her up to date, here are some lovely fall outfits--some dreamy, others--more casual. This outfit is made to fit an 18" doll. Some of the "harvested" materials are vintage linen, textured crisp silk organza, silk for the lining, real Baltic amber and wood beads. The dress has a snap closure in the back. Recommended for adult collectors. 2. Garden Fairy or Dahlia. This outfit is made for an 18" doll. Materials "grown" include: France Duval Stella cotton lawn, crisp silk organza, alpaca/silk yarn with tiny glass beads, cotton organdy for the lining. The dress features a snap closing in the back. Recommended for children 8+ or an adult with a soul of a dreamy child. This clothing set will fit a 16" doll. Materials "hummed" include: double gauze cotton, vintage ribbon for the dress, Japanese cotton/linen blend for the pants. The dress features a snap closing in the back, the pants have an elasticized waist. Recommended for a child 7+. Materials "blown" include: cotton double gauze for the shirt, cashmere for the pants, and a Liberty of London fleece for the jacket. This set is made to fit a 16" doll and is recommended to a child 7+. The material that will bring sweet dreams to the gardener is cotton jersey. The gardener should not be taller than 16". Recommended to a child 7+. All these clothing will be available through Dollectable store at 7pm EST on October 1st. Thanks for being a valued member of our Dreamy club!